• Realize you are in a battle! • A merely nominal profession is easy enough to make and to maintain after the manner of the times; but to be a Christian indeed, through and through, to eat, and drink, and sleep eternal life, to live the life of God on earth — this is the work, this is the difficulty. . . . . .
• As soon as you are washed in Christ’s blood and clothed in his righteousness, you must begin to hew your way through a lane of enemies, right up to the eternal throne. Every foot of the way will be disputed; not an inch will Satan yield to you. You must continue daily to fight. . . . .
• Now the question is how to win? 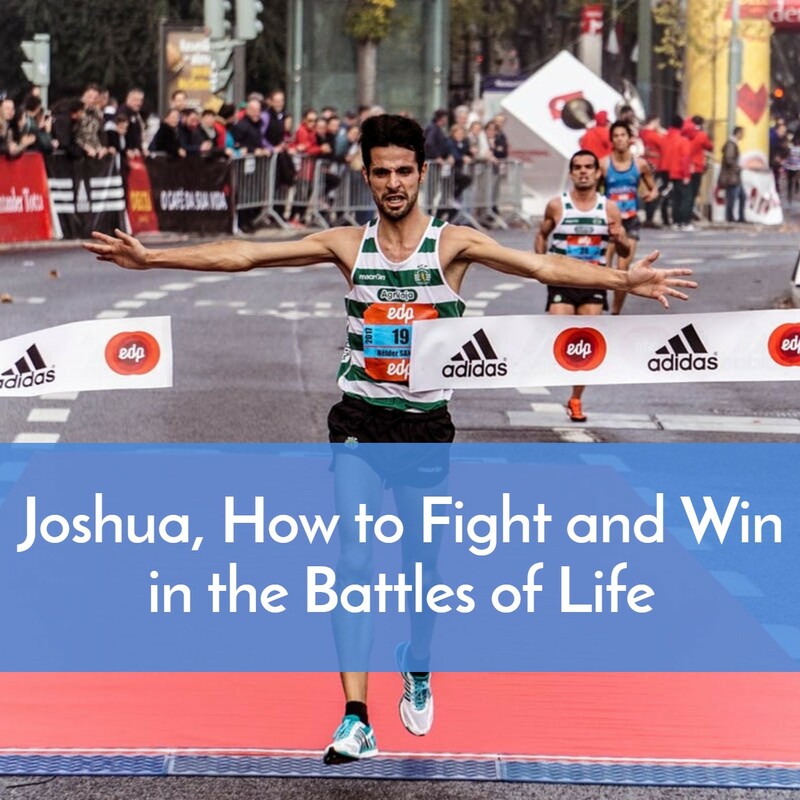 • And today we are going to look at the book of Joshua, a book of battles, to see how to fight in the battles of life and win in a way that pleases God. • After 40 years of wandering, Israel finally gets to enter the Promised Land. • Moses died in the promised land but passed on leadership to Joshua. • God was giving it to them, but they still had to fight for it. • We are going to look at how even though we may be doing exactly what God wants us to do, we can still have challenges, but with God’s help, not in our own strength, we can overcome them. • And then after each one, some applications. • We can learn both encouraging, positive applications, but also warnings because we also need to look carefully at the book of Joshua for what happens when we don’t completely obey God. • So, let’s get started! • τέλειος teleios, tel’-i-os; from G5056; complete (in various applications of labor, growth, mental and moral character, etc. ); neuter (as noun, with G3588) completeness: —of full age, man, perfect. • An extraordinary miracle and visible encounter with either an angel or the pre-incarnate Christ. Regardless it was an assurance that he would not be fighting alone. • Application: God can do miracles and is always there, but we still must do the fighting. • Josh. 2: 8-11 Before the spies were down for the night, the woman came up to them on the roof and said, “I know that God has given you the land. We’re all afraid. Everyone in the country feels hopeless. We heard how God dried up the waters of the Red Sea before you when you left Egypt, and what he did to the two Amorite kings east of the Jordan, Sihon and Og, whom you put under a holy curse and destroyed. We heard it and our hearts sank. We all had the wind knocked out of us. And all because of you, you and God, your God, God of the heavens above and God of the earth below. • Application: God often has people who are ready and willing to help when you are fighting God’s battles. • Sometimes unlikely ones that God has put in your path perhaps for you to change their lives—keep your eyes open! • Application: Where are you on basic obedience? Have you accepted Jesus as Savior? Been baptized? Part of a body of believers? As obedient as you can be to what you know to do? • Get up off your face! • If things don’t feel right, you don’t have peace, no matter how good something looks, don’t act on it until you know what God wants. • And still are today…..
Spurgeon: The Exactness Of Obedience Is The Essence Of Obedience. • “We must live, you know,” said a money-loving shopkeeper, as his excuse for doing what he could not otherwise defend. • [Spurgeon continues] There is no particular necessity for any of us living. We are probably better dead, if we cannot live without doing wrong. • The very essence of obedience, I have said, lies in exactness. • Probably your child, if sometimes disobedient, would still, as a general rule, do what you told him. It would be in the little things that thoroughgoing and commendable obedience would appear. • Let the world judge of this for itself. Here is an honest man. Do people say of him, “He is such an honest man that he would not steal a horse “? No, that would not prove him to be very honest; but they say, “He would not even take a pin that did not belong to him.” That is the world’s own description of honesty, and surely when it comes to obedience to God it ought to be the same. • And yet if a man stands to little things, and is minute and particular, worldlings charge him with being too stringent, too strict, too straitlaced, and I know not what besides; while all the time, according to their own showing, the essence of honesty and of correctness is exactness in little things. • If I profess to obey the Lord Jesus Christ, the crucial test will not be in great actions, but in little ones. My dear brethren, I wish the Christian church really thought this. • What if Jesus had lived his perfect life, healed, preached, but then did not go to the cross? • In 1968 Olympic marathon Tanzanian runner, Akhwari cramped up due to the high altitude of the Mexico City. He fell badly wounding his knee and dislocated that joint plus his shoulder hit hard against the pavement. He however continued running, finishing last among the competitors who completed the race. The winner of the marathon, Mamo Wolde of Ethiopia, finished in 2:20:26. Akhwari finished in 3:25:27, when there were only a few thousand people left in the stadium, and the sun had set. A television crew was sent out from the medal ceremony when word was received that there was one more runner about to finish. • As he finally crossed the finish line a cheer came from the small crowd. When interviewed later and asked why he continued running, he said, “My country did not send me 5,000 miles to start the race; they sent me 5,000 miles to finish the race. • The years passed, and the Lord had given the people of Israel rest from all their enemies. Joshua, who was now very old, 2 called together all the elders, leaders, judges, and officers of Israel. He said to them, “I am now a very old man. 3 You have seen everything the Lord your God has done for you during my lifetime. The Lord your God has fought for you against your enemies. 4 I have allotted to you as your homeland all the land of the nations yet unconquered, as well as the land of those we have already conquered—from the Jordan River to the Mediterranean Sea in the west. 5 This land will be yours, for the Lord your God will himself drive out all the people living there now. You will take possession of their land, just as the Lord your God promised you. • 6 “So be very careful to follow everything Moses wrote in the Book of Instruction. Do not deviate from it, turning either to the right or to the left. 7 Make sure you do not associate with the other people still remaining in the land. Do not even mention the names of their gods, much less swear by them or serve them or worship them. 8 Rather, cling tightly to the Lord your God as you have done until now. • Application: What words, challenges are you leaving for those who will come after you? • “We only bear the cross for a while, but we shall wear the crown to eternity. • One of the most important prayers! • For our spiritual growth and for all around us and who will come after us. 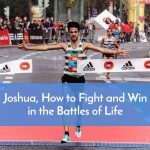 • May we remember these lessons from the book of Joshua so we might fight the battles the Lord gives us for our good and His glory.